Last Friday I mentioned I was heading off to Napa for a food event. The main focus on Friday was that trans fats are evil little devils. Oddly enough (synchronicity, people), Rachael Ray mentioned trans fats several times on her show this week. In one episode, she said that people should be able to choose whether or not to eat trans fats, then after chatting with a doctor about it, he changed her mind. I'm glad she reached that conclusion, since I wrote a post for Growers and Grocers all about why trans fats should be eliminated and a summary of the weekend. I also wrote about a wine tasting led by Karen MacNeil (who wrote the Wine Bible), about why the benefits of eating fish outweigh the risks from mercury and about signals of change in the food industry. Quite prolific late, aren't I? I filled an entire notebook with notes, so more posts will be coming out next week. 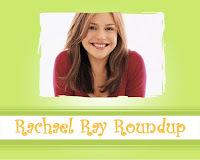 Here's all the Rachael Ray news and blog posts I found this week (well, all the ones I wanted to post, at least). If you write a post that you think would work well in the Roundup, email me. Michael Ruhlman (who I embarrassingly called Mark once in a post, bad blogger that I am) counts Rachael Ray among the "untouchable" Food Network stars in this New York Times piece about how chefs are making their money these days. Ruhlman also has a blog that you should check out. Cate at Sweetnicks tried her new Rachael Ray brand cast iron covered casserole pot and tried Rachael's Cuban Toasties and Fondue. She also reminds us of previous Rachael Ray recipes that are worth remembering, like Rachael's Chimichurri Chicken Bites and the Put Everything In It Mexican Surprise that Diane Sawyer shared on the first episode of Rachael's talk show. Ali at Something So Clever (who has a snazzy new design for her blog) was inspired by Rachael Ray to create pound cake with ice cream and warm chocolate sauce for dessert. Magazine Update: Analysts continue to state that Rachael's magazine Every Day with Rachael Ray is bucking the trend in the magazine business. Media Life says that while other magazines cannot raise their subscription rates: "Magazines like Rachael Ray’s can get what they ask for." Let's hope they don't raise the rates though! That Journalist at Words 'n' Such introduces a recipe of the week feature and offers a thought about Rachael Ray that certainly rings true with me: "But I love Rachael Ray because she got me out of the habit of simply popping a Lean Cuisine in the microwave for dinner, like most college students do." Another alleged Rachael Ray scandal. This time TMZ reports that Rachael said some remarks about Oprah. I tend to believe the statement at the very very end of the TMZ article: "it seems very convenient that these accusations are being levied at a time when Rachael's success has focused the public eye on her." Hollywood Grind isn't buyin' it either. The Minneapolis/St. Paul Business Journal reports that a Minneapolis restaurant featured on Tasty Travels, Auriga, is shutting down. Pavani at Cook's Hideout used Rachael's method for cleaning greens. If you don't want to do this in your sink, you can also use a big bowl. Nicky at Deglazing tackles the issue of whether Rachael or Giada would win a marinara sauce cook-off. Rachel at Rachel's Bite contributed Rachael Ray's Stuffed Roasted Strawberries for Sugar High Friday #27: Chocolate By Brand hosted by David Lebovitz. She said the result "is like a warm inside-out dipped strawberry." Sign me up. Claire at Cooking is Medicine tried Rachael Ray's Tomato and Bean Stoup. She would have liked a different texture, but sounds like she liked it. Rachael Ray's Jambasta recipe was featured on a fun site called Beer for Dinner. Fred Topel of CanMag asked Mandy Moore whether the caterer she plays in her new movie, Because I Said So, was based on Rachael Ray. Moore denied it. Rachael's hiring again. This time for her magazine. Lisa at the Wilson Times tried Rachael Ray's meatball stoup with much success.